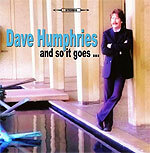 CD review: "and so it goes ..."
This review first appeared in the February 28, 2008 issue of the North County Times. Transplanted Englishman Dave Humphries has been living in San Diego County for over a decade now, but his fourth CD shows that his heart and influences remain distinctly British. Distinctly 1960s and '70s folk-rock, too, for that matter. The 11 songs on "and so it goes ..." have a decidedly early '70s feel to them  while the Beatles are a definite influence, so are the Kinks, Fairport Convention and Al Stewart. Still, it's not as if Humphries is just regurgitating a bunch of what's already come before. He wrote or co-wrote all the songs on the album, and there's a warm charm to every one. He's got a nice ear for turning out McCartneyesque melodies, and has a rough-hewn charisma in his singing voice. With Tony Sheridan, whom the Beatles themselves once backed on record before their own breakthrough, on guitar for five of the songs, Humphries has created a CD that is a natural progression of the original British invasion.